On Tuesday, June 22 the Form-Based Codes Institute will conduct a webinar addressing the incorporation of sustainable design elements in form-based codes. Five experts (Victor Dover, Bill Lennertz, Tom Low, Dan Parolek & Dan Slone) will discuss renewable energy systems, stormwater and wastewater conservation, urban agriculture, community-based transportation and landscaping using examples from their work across the country. Participants are eligible for AIA and AICP credits. Lee County, Florida adopted land development regulations for managing conservation & development in the 83,000 acre Southeast Lee County DR/GR on June 8. 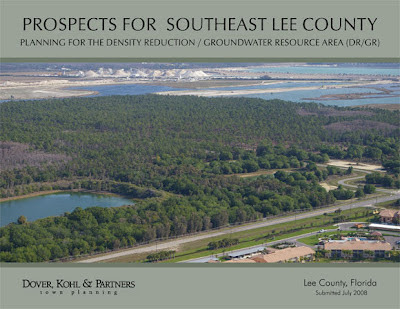 The Southeast Lee County Plan became fully operational with the adoption of land development regulations limiting mining to an area of lesser environmental sensitivity, and providing a transferable development rights program combined with a form-based code. The Density Reduction/ Groundwater Resource Area hosts neighborhoods, mines, farms, endangered species and public supply wells. The plan recommends the optimal mix, locations and form of uses and utilizes a Transferable Development Rights Program to keep each use compact and preserve critical natural systems. The plan was adopted in March of 2010 by the Lee County Board of County Commissioners. In collaboration with lead planners Gateway Planning Group, Dover-Kohl will be working on-site in South Padre Island, TX during an upcoming Design Workshop from June 9 through June 16, 2010.